We’ve taken our amazing Buttercream Frosting recipe to the next level by adding delicious fresh raspberries. It definitely is The Best Raspberry Buttercream Frosting you’ve ever tasted! It used to be that fresh Raspberries were only in season in the late summer but that is not true anymore. 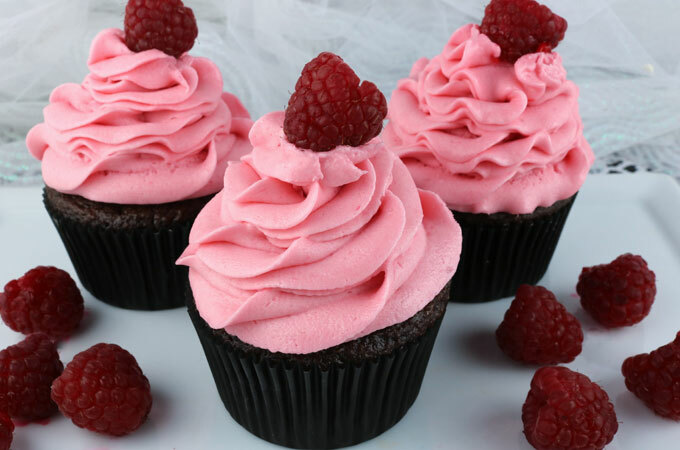 You can find them in your grocery store from May to October now … so you have no excuse not to try our delicious Best Raspberry Buttercream Frosting on your next batch of chocolate cupcakes! Light and fresh with just a hint of tart, this yummy homemade frosting will take whatever you are baking to the next level, we promise! In a mixer, add the powdered sugar. Add the softened butter and cream together on low speed until the powdered sugar and butter are completely combined. Continue to beat on medium speed until the frosting is creamy. Add the 1/2 cup of Pureed Raspberries. If the frosting is too thin, add 1/2 cup additional powdered sugar. Keep adding powdered sugar 1/2 cup at a time until you have the frosting at the desired consistency. If the frosting is too thick/dry, put a little bit of water in the raspberry puree container that you used and then add this liquid to the frosting 1 tsp. at a time until you get the desired consistency. Visit @ twosisterscrafting.com for full directions.